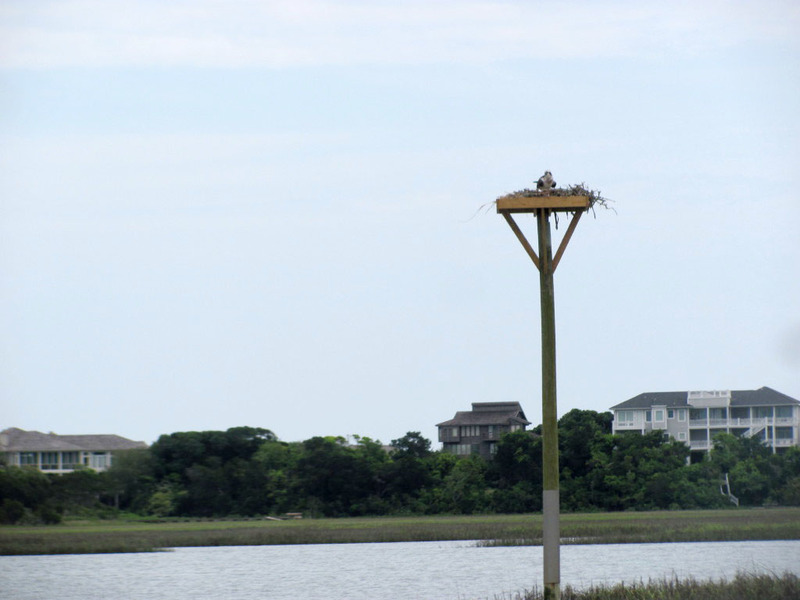 In 2014 we replaced Osprey nest platforms in the Conservancy’s North Marsh property located between the Intracoastal Waterway and north end of Figure Eight Island. This past summer (2017), all four Osprey nest platforms were occupied by nesting osprey! While many Osprey chicks were observed during the early part of their respective development, it is not known how many offspring successfully left the nest (fledged). Ospreys are migratory fish-eating birds that spend winter in southern North America, and Central and South America. Ospreys migrate north in early spring to reach breeding grounds, including the Conservancy’s North Marsh property behind Figure Eight Island. While the North Marsh property is protected by a conservation easement, it is a habitat that needs monitoring and management in keeping with easement requirements…and the needs of Ospreys.